/ Modified sep 20, 2017 10:08 a.m.
VIEW LARGER Workers head to rescue operations in Mexico City on Sept. 19, 2017. More than 200 people were reported dead as of Wednesday morning. The epicenter for the 7.1-magitude quake was located about 75 miles south of Mexico City, where reporter Jorge Valencia is based. Valencia was in his seventh-floor apartment when he said he noticed the windows start to rattle, and immediately dove under his desk. "It’s just a really scary thing, when everything’s shaking. I mean, my building was swaying — like tall grass in the wind," said Valencia. He said he saw many damaged building and cars, as well as crowds of office workers streaming out of buildings and into the street. "People are very shaken, and I mean that literally," said Valencia. "I saw people who were literally just looked like the blood was drained out of their face. Their hands were shaking. There were people who were thinking about the earthquake that hit two weeks ago. There are even people, every single time that this happens, people think back to 1985." KJZZ’s Mexico City Bureau Chief Rodrigo Cervantes felt the quake and reported that heavy traffic clogged the streets as people rushed home from work to re-unite with loved ones. 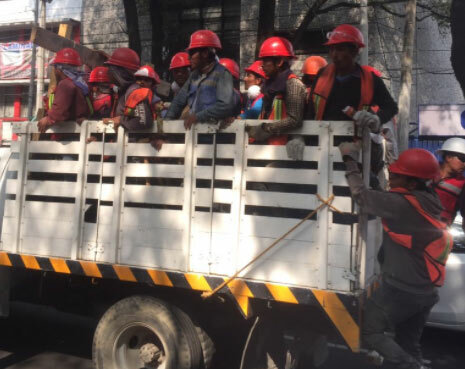 “What the government of Mexico City and the government of Puebla are doing is to cancel any operations from the government offices as well as suspending classes for the school," said Cervantes. Earlier in the day, buildings across the city held preparation drills on the anniversary of the 1985 quake. Much of Mexico City is built on former lakebed, and the soil is known to amplify the effects of earthquakes even hundreds of miles away. Seismologists say this earthquake is not connected to a larger quake that happened in Mexico 11 days ago.